Pod Save America – Favreau, Lovett, Vietor on Tuesdays, Favreau and Pfeiffer on Thursdays. Pundits like the ObamaBros of Crooked Media dance around the main issue. In last Thursday’s Pod Save America ep, Favreau and Pfeiffer say all the right things, except one. They fail when it comes to addressing racism. 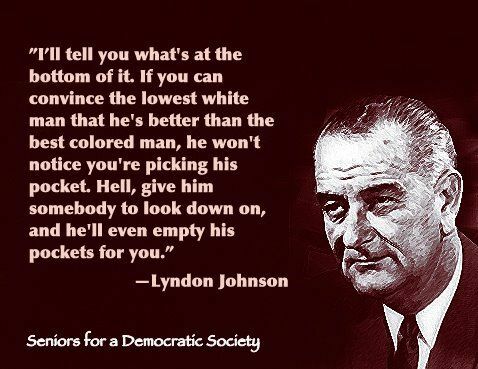 LBJ got it right when it comes to Southern Strategy racism. He knew that signing the Civil Rights Act of 1964 would set the Democratic Party back generations in the rebel states. Nixon turned LBJ’s concern into a full-blown strategy. He ran on it and won in 1968. While Nixon’s corruption ended his administration, racism remained. Carter’s defeated Ford because Nixon was a crook. Reagan defeated Carter because Ronnie ran as a racist. Reagan knew how to bring fear from a simmer to a boil. His rhetoric on the Black Panthers in California contributed to the fear and uncertainty of white voters. Nixon teed up the racism. Ronnie added the fear. Carter wanted people to practice compassion. Reagan wanted a 600-ship Navy. The racism never left. Radical clerics like Falwell and Robertson gave racism a cross. Trump expanded the hate. Now it includes brown folks from the Middle East. When Al Qaeda and ISIS cooled down, Donnie added MS13, promoting fear. Why don’t the pundits address racism? It’s simple: #whiteprivilege. The Crooked Media pundits outsourced race relations to Deray McKesson. A former teacher, now full-time activist, and author, Deray hosts Pod Save The People on Crooked Media. While Deray, along with regulars Brittany Packnett, and Sam Singyangwe, and Clint Smith, III, address racial issues, the white guys focus on white pundits. In Thursday’s ep, Favs describes how Republican pundits freaked out when talking to reporters. They told the world the nomination was on life support. But, of course, it wasn’t. That’s because McConnell had the votes. So-called knowledgeable liberals pointed out the delays. They argued McConnell didn’t have the votes. By Saturday, they all lined up. And the guys can’t figure out how that happened? They understand the strategy. They know Republicans raise the flags of racism and fear. While they get it, they soft-pedal the whole thing. MS13 becomes “immigration”. They don’t even mention black folks. Those Republicans knew they had the votes. They operate with different motives. Republican operatives want guest editorials. They want spots on Tapper’s CNN show. The never-Trumpers want mentions from Hayes and Maddow. If they say, we have the votes, those opportunities dry up. Favreau and Pfeiffer need to get off twitter. They need to talk more to their own colleagues. We’re not going to affect change by ignoring racism.